CHRIS FROOME STRUCK an early blow on his Tour de France rivals as his Sky team-mate Geraint Thomas won the opening stage in Dusseldorf on Saturday. It was a great day for Britain and Sky, as Thomas will wear the coveted leader’s yellow jersey for the first time on Sunday. “I didn’t really expect it, I didn’t know what to expect,” said Thomas. Reigning champion Froome put more than 30 seconds of time into his main rivals for overall victory as he tamed the tricky course and conditions better than they did. 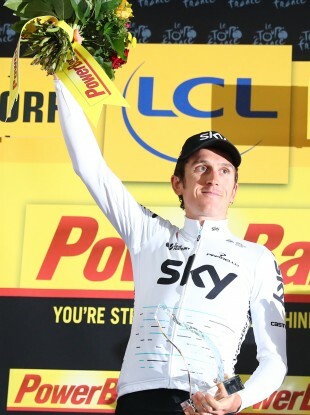 For Sky it was a great success with four riders in the top eight as 2015 world time-trial campion Vasil Kiryienka took third and 2014 world road race champion Michal Kwiatkowski was eighth, two places behind Froome. Swiss time-trial champion Stefan Kung was the closest to Thomas, finishing second at just five seconds off the winning time of 16min 04sec. Even four-time world champion Tony Martin, the German who had dreamt of winning the opening stage in his home country, could not deny Thomas as he managed only fourth, despite leading at the only time check after 8.1km. But while Froome, Sky and Britain celebrated, is was a bad day for Colombian Nairo Quintana and his Movistar team as his chief domestique Alejandro Valverde crashed out of the race. Spanish veteran Valverde, who was third overall two years ago, crashed hard on a slippery bend in miserable wet conditions and was visibly in great pain. The 37-year-old seemed to jar his left leg when he touched his foot down as he lost his back wheel, before skidding hard into the metal crash barriers. It was immediately clear he wouldn’t be able to continue but his team frantically tried to move him as he was stranded on the apex of a tricky bend, with many other riders set to come around it having set off at one minute intervals. “Unfortunately @alejanvalverde cannot continue in the race. What sadness to finish a Tour on the first day,” said Movistar on Twitter. Not only will Quintana be without one of his key lieutenants in the mountains, but he lost 36 seconds to Froome. That was par for Froome’s main rivals with Australian Richie Porte losing 35 seconds, Frenchman Romain Bardet 39sec back and two-time former winner Alberto Contador giving up 42sec. Frenchman Elie Gesbert, on his 22nd birthday, had been the first rider to set off under grey skies and a sprinkling of rain as the 2017 Tour got underway. The early lead changed hands several times before Kiryienka of Belarus posted a mark of 16:11. His Sky team-mate Kwiatkowski matched Kiryienka’s time of 9:20 at the time check, but he couldn’t maintain that pace and finished eight seconds back. But the time was beaten by another Sky rider as fast finishing Welshman Thomas, who was three seconds down at the time check, took seven seconds off the finish line marker. Martin, as expected, went quickest by a second at the time check, but he faded over the second part of the course and an anxious looking Thomas breathed a sigh of relief. But he had to wait until Froome crossed the line, around 45 minutes after he had done, before he could celebrate. 1. Stefan Kung (SUI/BMC) 16:09. 2. Pierre-Roger Latour (FRA/ALM) at 0:20. 3. Alexey Lutsenko (KAZ/AST) 0:24. 4. Timo Roosen (NED/LNL) 0:29. 5. Simon Yates (GBR/ORI) 0:32. 6. Emanuel Buchmann (GER/BOR) 0:35. 7. Jasha Sütterlin (GER/MOV) 0:36. 8. Mike Teunissen (NED/SUN) 0:36. 9. Nils Politt (GER/KAT) 0:36. 10. Damien Howson (AUS/ORI) 0:38. Email “Froome lands blow as Britain's Thomas claims yellow after opening stage of Tour”. Feedback on “Froome lands blow as Britain's Thomas claims yellow after opening stage of Tour”.